RadioGirlProductions: If Students Are The Future Why This Shocking Wastage ? If Students Are The Future Why This Shocking Wastage ? A concerned resident of a university city recently took to social media to reveal shocking evidence of student wastage and to voice understandable disgust about it. . Shocking photo after photo showed what many students simply left behind and dumped as they left university. They threw it out knowing it would be destined for landfill. It included clothing, bedding, kitchen goods, appliances, electronic equipment and non-perishable food, It is terrible to imagine this all wasted while many go without. With so many people having to use 'food-banks' , and so many people struggling to afford clothes and home essentials, it stuns me that people could be so wasteful, and I wonder if this is the scene at other colleges and universities too. One would hope students, would know better than to be so wasteful when leaving student accommodation. Knowing that this is just a fraction of the stuff that these students threw away without thought, leaves a bad taste in my mouth too. What was the scene at other universities I wonder? With so many in need, these items could be and should be put to good use and given to people in need of them , this waste cannot be allowed to go on. The university , whilst not responsible for what their students throw away, should set a responsible example and get pro-active. So many new incoming new students could surely make use of these goods and clothes, as could many people who are struggling to get by. 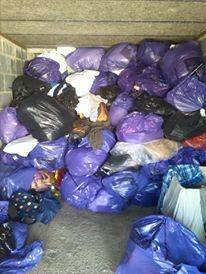 Perhaps much of the clothes and bedding could be sent to refugee camps or homeless shelters? Heaven knows those unfortunate people certainly could do with some help. Wouldn't it be wonderful if campuses around the world did this? In the meantime, please think about what you throw out, we have drained so much of the Earth's resources as it is, this throw-away society mentality is a crying shame.